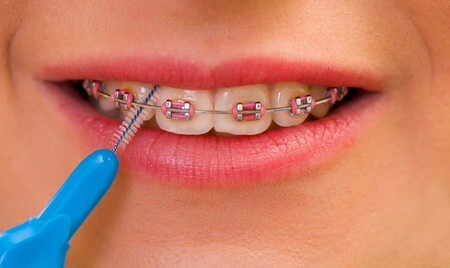 Having braces is not as difficult as it may seem. It’s just a retention process that enables the restructuring of the human teeth for a beautiful, perfect smile. The process can take months or years depending on the system of braces and how long it will take for the teeth to transform. However, in the end, the process will be worth it. Many individuals have used braces and now they are loving the look and feel of straight, perfect teeth. Individuals who didn’t smile in their pictures now post ten selfies a day to show off their perfect, white smile. Having braces is not hard to maintain. Here are some helpful hints and tips that will make the process easier. It is important to keep your teeth and braces clean. This will help your teeth move faster and stay fresh and white. Maintaining clean teeth and healthy gums will prevent cavities from developing. Don’t forget the importance of brushing properly and effectively. Use floss after every meal. Food often gets stuck in the braces after you eat. Make sure to get the “hard to reach” places that are hidden. Different types of foods can easily damage or break braces. Stay away from hard foods such as raw carrots, nuts and hard candy, etc. Stay away from sticky foods such as gum, candy, caramels, etc. Eat soft foods because they won’t harm the braces. Be careful when using rubber bands on your braces. They can easily pop causing harm to the gums and cheeks. Soreness is suspected to occur during the first week of having braces. Just apply wax to the area overnight, that way the gums and cheeks can adapt to the braces. Wires in the braces often shift causing irritation to occur around the lips and cheeks. Simply place wax over the sharp metal and call our office. Don’t be scared if you notice that your teeth are hitting your braces. This is expected since your teeth are shifting. Check your braces every day to monitor if there is a break or if they have loosened. If one of these has occurred, please call the doctor’s office and make an appointment. For any additional information, please contact McDermott Orthodontics via our office contact pages or telephone to schedule a complimentary consultation.